Her mother died when she was four years old; her surrogate mother abandoned her a few years later, plunging Therese Martin (Lindsay Younce) into a mental collapse. Then something miraculous happens. At the age of 14 she undergoes a mysterious conversion and falls deeply in love with God. Then, not old enough for the convent, she goes all the way to the Vatican, where she boldly steps forth at a papal audience to beg for permission to become a Carmelite nun. In the monastery, Therese, a teenage girl, gains insights that breathe fresh air into the Catholic Church and transform the world. Challenged by the austere, cloistered life, this pampered child discovers a simple way of loving God. 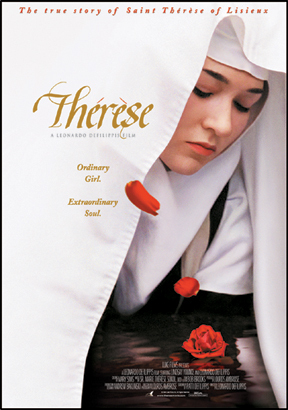 n a lavish period production, comparable to Merchant Ivory's "A Room with a View," THERESE tells the true story of Thír–se of Lisieux, the most popular saint of modern times. It's a story of struggle and tragedy, and the greatest of all romances -The story of an ordinary girl with an extraordinary soul.